Use FDSNWS to access station metadata in FDSN StationXML, StationXML and SC3XML formats; time series data in miniSEED format; and event parameters in QuakeML and SC3XML formats. For full details visit: http://www.fdsn.org/webservices/ and https://www.seiscomp3.org/doc/jakarta/current/apps/fdsnws.html. The RASPISHAKE data center has been included in the IRIS Federator system. See also: IRIS FDSN Stats. These MATLAB and Python toolboxes are useful for programmers who want to create their own data visualization or processing routines. Description: Dump seedlink (seismological) time series into InfluxDB. 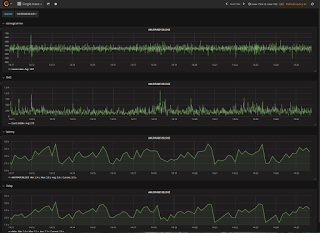 Use Grafana to plot waveforms, real time latency delay, etc. Maps uses the grafana worldmap-panel plugin. Also some of the examples that may be useful are here. This should be the same as the corresponding github code, just with the dependencies and so runnable.